The Department of Adult and Pediatric Neurosurgery at the University Hospital Charite deals with the treatment of the peripheral and central nervous systems. Located at the Charité Campuses Benjamin Franklin and Vichow-Klinikum, the department is headed by Prof. Dr. med. Peter Vajkoczy. With the state-of-the-art medical equipment, the department performs 5,000 surgical procedures every year. It offers both surgical and conservative treatment of all neurosurgical diseases. In addition, to provide patients with the comprehensive treatment, the department maintains close cooperation with the other Charité departments. Since 2007, Head of the Department of Adult and Pediatric Neurosurgery, University Hospital Charite. Since, 2006 Visiting Professor in Neurosurgery, Heidelberg University. 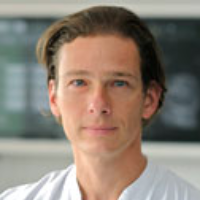 2001 - 2006 Senior Physician and Head of the Department of Neurosurgery, University Hospital Mannheim, University Hospital Heidelberg. 1995 - 2001 Professional medical training, Department of Neurosurgery, University Hospital Mannheim (Prof. Peter Schmideck). 1992 - 1996 Thesis, Institute for Surgical Research, University Hospital Grosshadern, University of Munich. 1988 - 1995 Study of Medicine at the Ludwig Maximilian University of Munich. 2003 Research Award for Young Neurosurgeons of the World Federation of Neurosurgical Societies (WFNS). 2003 Wolfgang Hoffmeister Award, Medical Faculty of Clinical Medicine in Mannheim, Heidelberg University. 2002 Research Award, German Academy of Neurosurgery. 2001 Hemedex Pioneer Investigator Award. 2001 Hermann Rein Award, German Society for Microcirculation and Vascular Biology. 1998 Aesculap Research Award, European Association of Neurosurgical Societies (EANS). 1998 Pharmacia & Upjohn Young Investigator Award, American Association for Cancer Research (AACR). 1998 Reisepreis, American Association for Cancer Research (AACR). 1990 - 1995 Scholarship, German Foundation (Studienstiftung des Deutschen Volkes).